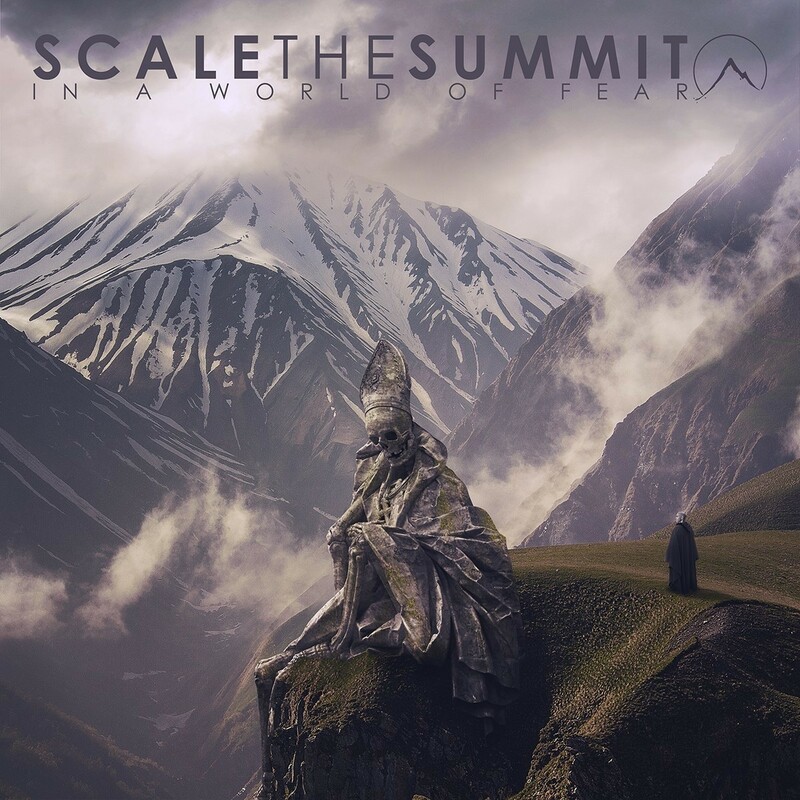 Two years after the release previous album V, and in a year which celebrates the 10th anniversary of a debut album Monument, Scale the Summit, led by guitarist and composer Chris Letchford, is about to release a new, sixth album titled In a World of Fear. With quite a few guest guitarists contributing to the new album, and a new line-up which features bassist Kilian Duarte and drummer Charlie Engen beside Letchford, In a World of Fear feels like the most organic release in the band’s discography. The album is out on May 19th, and we caught up with Chris to talk about it. He revealed us that it was planned to have Allan Holdsworth doing a solo for one of the songs on the new album, but due to Allan’s death that didn’t happen. Chris also told us that he would love to do a Scale the Summit album with vocals. Looking at the album title In a World of Fear and the album art, it’s clear that there is a certain message you want to transmit. What is it? Although it’s an instrumental album, is there sort of a concept lurking beneath? Chris Letchford: Thanks, but honestly, not really. I just happened to write a darker album this time around so I was searching for a darker style of cover art to match what I was titling the record. I’m sure we all agree we live in a world that is based around fear more than ever, especially growing over the past couple years with how much social media has expanded. We literally see everything now. So it’s not like more crappy things are happening, it’s just that we see it all. I remember as a kid watching the news on the TV and that was the only way we got it. So the majority of it was local to the Houston area where I grew up. Now we get the entire world daily, so it makes it feels more overwhelming with negativity. The new album marks your transition from a quartet to a power trio setting with you, bassist Kilian Duarte and drummer Charlie Engen. What were the biggest challenges with this transformation, and how will that affect your live performances? Chris Letchford: I had written all the guitars for the past 3 STS albums by myself, so this new one was written pretty much the same way. The only thing I changed was I wrote a lot of the music as I was recording it. Before I would write all the music into guitar pro so that I would remember it later… but this time I was able to hear it more in its final form, which definitely helped make a record I personally was more proud of. So it’s technically still a four-piece, if we are getting even more technical, it’s really a five-piece now that I have added more synth and layers. As far as live, I’ve been hit up by a bunch of really incredible guitar players, so for touring we may go with a touring guitarist for the second guitar parts, but we may just keep it as a three-piece to make touring a little easier. You have a few guest guitarists playing throughout the record. Did you write songs with a particular idea evolved for Jeff Loomis, Angel Vivaldi, Nick Johnston, John Browne, James Ivanyi, Per Nilsson, Scott Carstairs, Nathan Navarro and Yvette Young? Did you map out from the beginning that the songs are constructed aimed for their contributions? I suppose that the new album was written for a trio setting, not counting the guest contributions. How will you be re-compensating this on your live shows? Will you be using additional software and hardware for these missing parts, or do you plan on engaging a second guitarist? Chris Letchford: Like I mentioned earlier it’s still technically a four-piece like before, with 2 guitar parts. So for live we’ll see when the time comes. I have a bunch of guitarists that already tour professionally hit me up so it will take two seconds to get someone if we need one. Just depends on budgets for each tour, we may go the backing track route. The guitar tone on this new album feels more stripped-down, more raw than it was the case on your past records. At least that’s something that I though after hearing the songs released so far. Was it a conscious idea to go for that sound or the result of experimenting during the creative process? Chris Letchford: That’s funny you mention that because I was just talking with the guys the other day about how I hated how “raw” the guitars have been on all the past records. [laughs] These are, at least in the files, the most wet guitar leads we have ever done… And then the most fat and heavy sounding guitar tones we have done, again, this is just going off looking at the EQ and the way the record was mixed. Thats what makes audio so interesting, to one person it sounds raw, to the other the exact opposite, ha. With the mentioned musicians that contributed to In a World of Fear, are there any musicians that you would want to collaborate with, be it with Scale the Summit or something else entirely? Chris Letchford: That’s an endless list! The biggest downer not only for this record but just for life in general was I had Allan Holdsworth in the works for doing a guest solo on the record. We were playing phone tag for weeks, but we ended up running out of time for this album as I had to get vinyl and CD’s ordered. A couple of weeks ago I was actually getting ready to start writing and recording a song specifically to have him do a guest solo on for the next, next STS album. I didn’t want to miss out on the opportunity to have such an amazing player and guy play on one of my songs. Only, days later he passed away, it was a really sad time, and again my thoughts go out to his family. It just floored me since he had just been out playing shows and attempting to throw down a solo for STS. The only positive thing here is that he left us literally doing what he loved and had a guitar in his hands until the end, I can only hope I can have the same. Then, not to put the guy on the spot or anything, but I sent a track from this new album to Ross Jennings, the singer of Haken. We are deleting the guitar leads and having him do guest vocals, as long as the schedule and him liking what he comes up with, comes together. So only time shall tell! I hope it works out as I love their new record and this STS song, with leads deleted will make for a really cool bonus song with vocals. It will be released in its original form for the official album and then I’ll re release it with the bonus vocal track! As for other guys, my goal is to track down Guthrie Govan to have a guest solo on a future STS record. Besides STS, I did a jazz-fusion-ish album with the drummer and keyboard player of The Reign Of Kindo, one of my favorite bands. The record was released under my name and titled Lightbox. I more recently released another solo project titled islnds: history of robots, and I got guest vocals from Ashe O’Hara (ex-Tesseract) and the singer of The Reign Of Kindo. All those guys are just amazing at what they do! It’s been a couple of months since you became endorsed by Kiesel. How did that collaboration come about? Chris Letchford: I had always kept an eye out on what Kiesel was up to. I can’t remember when but they had originally sent a few guitars out to the past STS guitarist to check out and of course me being around, I had to check them out, they were awesome. Some time past, I think over a year and then Jeff, the owner hit me up and said he wanted to chat. He sent me out a Vader, knowing that I was all about headless guitars and I just fell in love with it. A couple months went by and I flew out to Kiesel to start designing my signature model, it was something I always wanted to accomplish, was a signature model designed by me drawing it on paper, and then seeing the real talent make it with wood. [laughs] It came out awesome. It’s nice to have a real home with a guitar company that actually wanted me there as well. They have the “family” message, and they mean it. I stayed with Jeff and his family for the week I was out there and it was a great time. What are the specifics of your signature Kiesel models? I guess that there are 6 and 7-string models available in different finishes. Chris Letchford: It’s available in 6, 7 and 8 string. The way Kiesel works is they have a base price for each model and then the customer gets to pick all of their woods, hardware, pickups, and finishes. So you are technically ordering a custom guitar exactly how you want it, and then they make it within 3 months, but unlike all the others that advertise that time frame, they actually deliver the guitar within the time frame they tell you. I have been burned so many times in the past by one man luthier companies that I have had enough. One guy took $700 deposit over 6 years ago now, still waiting on two 7 strings, lol. I’ve accepted they are not going to show up. Except the new guitars, have you changed anything else in your studio and live guitar rigs? Chris Letchford: Yes! I recently switched over to Line 6 and started using their Helix FX processor even though I consider these things “the amp,” they are just not powered by tubes and can not power a cab. I also switched over to Seymour Duncan and started using their Sentient/Pegasus passive set. I had been playing actives for years and was ready to go back to passives. Back to music, do you have any plans for your second solo release? Chris Letchford: I want to do another Lightbox style record, the one I did with The Reign Of Kindo guys. Scale The Summit is finally out of our crappy record deal and doing things all DIY from here on out, so it’s of course more time consuming with all the busy work, but it’s 100% worth it! That being said, it’s hard for me to get extra time. I will eventually do more solo records, but for now I have nothing written or planned. So far there are not any Scale the Summit tour dates announced. What are your plans when it comes to the live promotion of the new album? Chris Letchford: I’m not sure. I personally got really burnt out with how much we were touring that I’m kind of waiting for something extra special to come up. I really want to play this stuff live, but the older I get and with the life I have built with my wife, I’m trying to find balance. She has become one of the largest romance authors in the world in just the past couple of years and is doing signings all over the world, so I have been just tagging along helping her with her career now, a nice break as it used to be the opposite! It’s been over a decade of doing STS full time and spending nearly my entire day doing band stuff, every day of the week. I feel so grateful to be able to play music for a living that I don’t want to get completely burnt out and quit, ha. So I’m just continuing to make sure everything is more balanced. Along with the new album you launched a new merch line with new designs to accompany the album release. How important is merch for a band like Scale the Summit at this time and age? Chris Letchford: It’s important simply to give fans options and keep things fresh. It’s also nice to have cool themed package deals that match the album and its vibe. I have always loved searching for and hiring graphic designers to make merch for the band. It’s one of those creative processes that keep things fresh even for me. I have always loved visual art, so it’s a way to still be involved in that scene. I use to design a lot of the STS merch, but over the past 5 years I have had zero time for Photoshop sadly. With both Scale the Summit and your solo work you play fully instrumental music, although your islnds project included two songs with vocals. Have you ever been involved and do you have any plans to form a band with a classic line-up featuring a singer? Chris Letchford: I have zero energy to start a new band. [laughs] With running STS full time and without a record label, and kind of starting all over, that sounds emotionally and physically draining. [laughs] Like I mentioned earlier with Ross from Haken, I would like to keep doing more things like that. I have always liked when bands release instrumental versions of their vocal records, so I’ll see how this goes and maybe do the opposite and have an entire record of STS with a vocal version and maybe get different singers for each track. So many things I want to do and so little time! In a World of Fear is out on May 19th; pre-order it from Bandcamp.